Oh. Mah. Gawd… Shoes. Wait, did I just say that out loud? Damn, the secret’s out. Who says women are the only ones that get to enjoy beautiful footwear? There is no greater joy than the feeling of slipping on a fresh pair of shoes. None. Not even finding onion rings in your fries. So how does such happiness come from those things you slip on your feet? Comfort? Cost? Cosmetics? 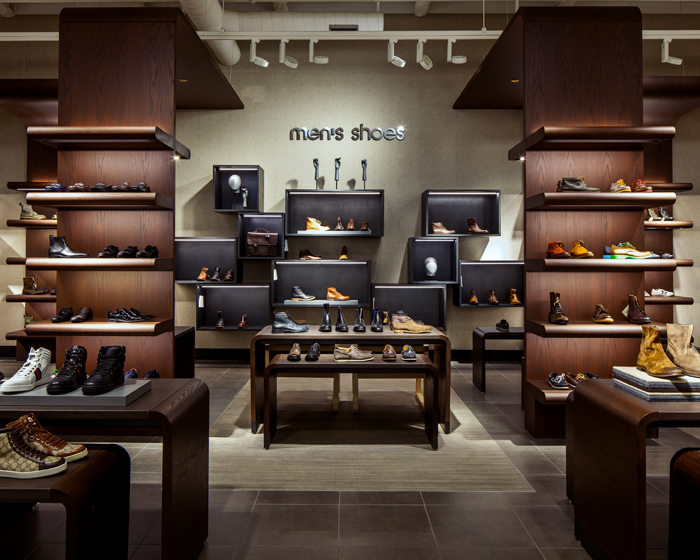 Against conventional wisdom, most shoes in the modern market tend to decline in comfort as the price tag rises. Even the most hi-tech sneakers will usually cap at around $300, whereas designer shoes, with paper-thin cushioning and minimal structure, can cost upwards to $5000. Dipped in gold, covered in crystals, or sprinkled with diamond dust, the world becomes your oyster on the quest for your Cinderella shoes. However, glitzy footwear is not for everyone. Most of us “Everyday Joes” are sufficient with our dress shoes for work and sneakers for everyday comfort. The high prices of designer footwear are justified by the luxury aspect applied to the footwear through the quality materials. The root of every great endeavor begins at the feet. A man can carry the world on his shoulders, but the shoes carry the man. That is why a proper selection of footwear is of utmost importance. You will notice that most of these shoes possess a functional background fundamental to their respective designs. So, now it’s time for storytelling. The epitome of footwear royalty, Oxfords are the finest shoes a man can wear. Originating from Scotland and Ireland, the shoes gained popularity at Oxford University when rebel students wore these instead of knee-high and ankle-high boots. 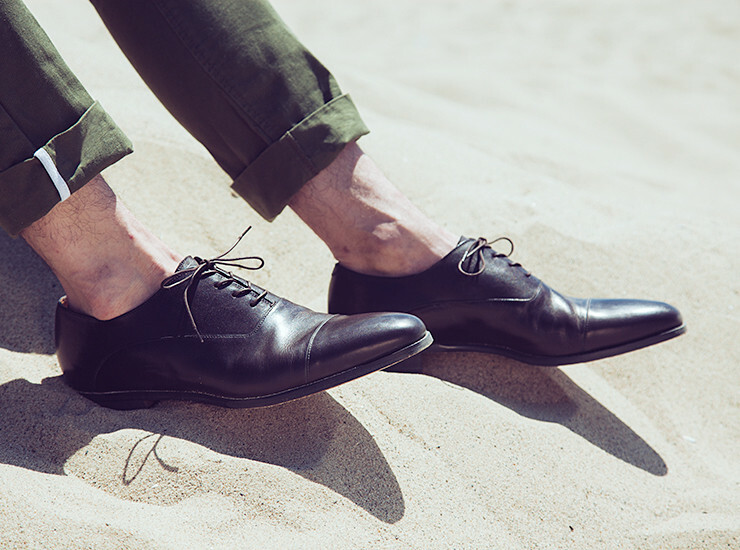 Oxfords are the most formal type of footwear you can own and should only be worn with dress pants. Black and brown are the most common colours due to their versatility. Black can be worn with any colour suit as long as you wear black socks. Brown shoes can be worn with any colour sock but CANNOT UNDER ANY CIRCUMSTANCES be worn with a black suit. The contrast break in colour between the suit and the shoes would devastate mankind for years. 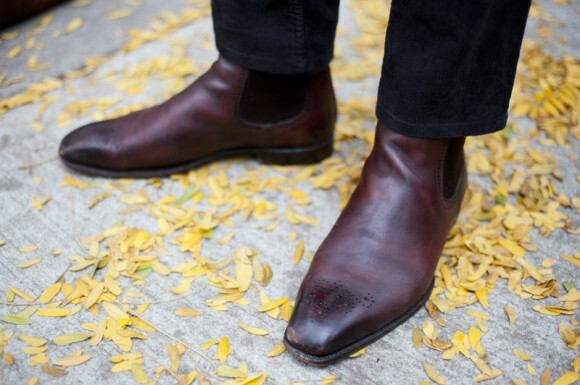 With all these rules surrounding Oxfords, you’d think they’d be the Debbie Downers of footwear. Nothing could be further from the truth. Along with cap-toe, buck, wingtip variations, there is a multitude of shoes inspired by Oxford origins. 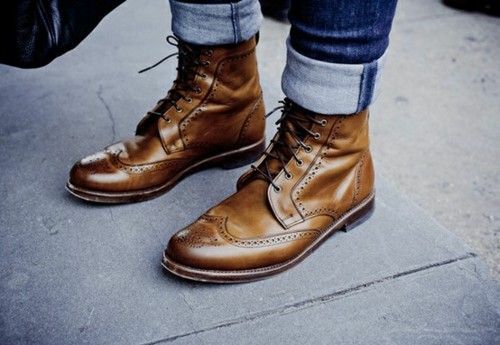 Officially addressed as Oxfords with Brogue detailing or, as I affectionately call them, dress shoes with attitude. The holes were initially included to let water out when Irishmen used them to cross marshes and bogs. Now we don’t recommend you go scuba diving in these, but instead, use it as an alternative to the conventional Oxford or if you want to dress up your casual look just a tad. The trademark detailing on the cap of the shoe features a pointed toe with extensions running along the midsole, resembling a bird with open wings, hence the name. Stylish, fun, and daring, you’ll be soaring in these shoes in no time. Nothing says Hollywood like a pair of suede Oxford wingtips. 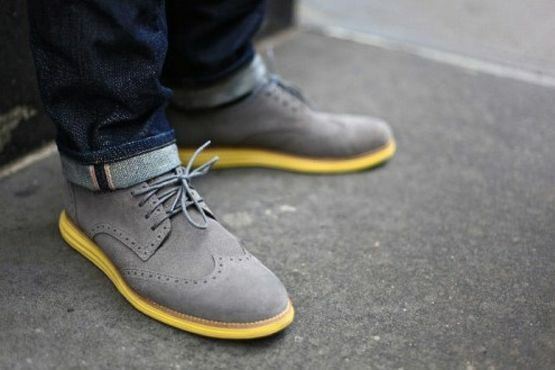 The suede and the wingtip design dress down the shoes as well as up the comfort and the swagger. If you’d like to bring attention to your footwear, go sans socks as the open pores in the suede will make the shoes more breathable. 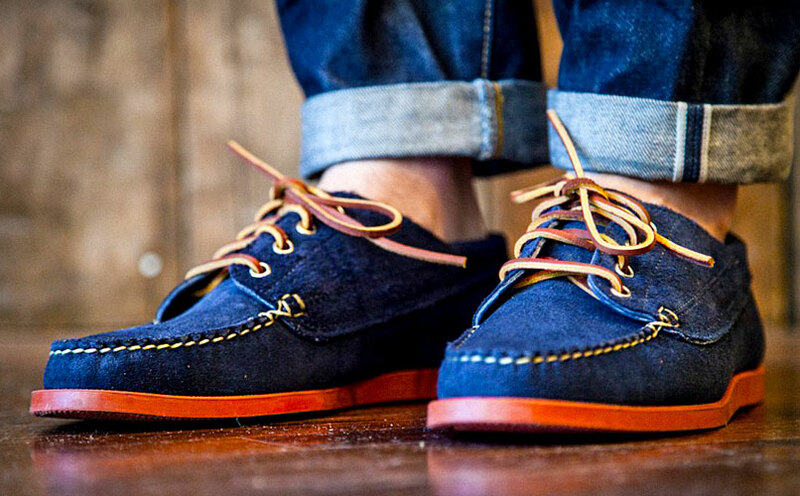 However, the delicate nature of suede requires routine cleaning and maintenance after every wear. 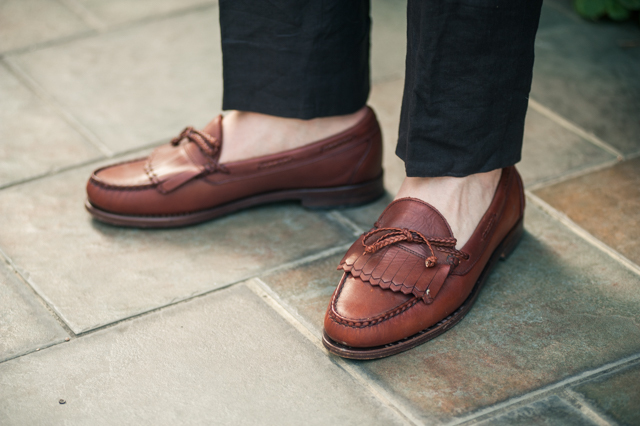 Flip-flopping on the border between casual and formal, loafers are essentially a dressier boat shoe. Its slip-on functionality and aesthetic versatility makes it an immediate hit for the businessman by day and partygoer at night. Its comfort, appearance, and versatility are only matched by how easily they slip on, thus cementing itself as a staple in any man’s shoe closet. They can still be worn fashionably sans-socks but if you are to wear these with socks, choose any sock colour but black. Just try it and you’ll know why. 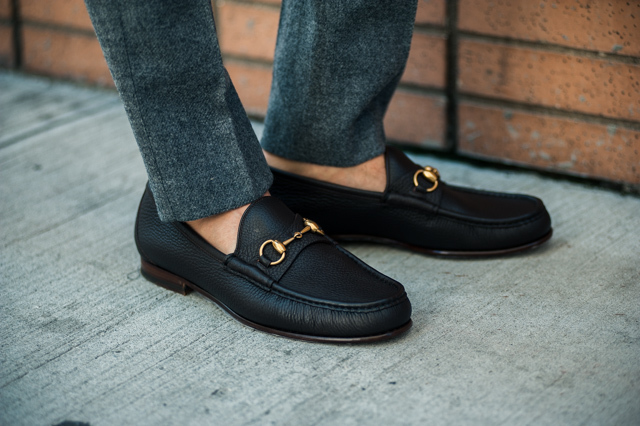 Not a loafer per-se, but moccasins share the same slip-on functionality as loafers. Composed of leather and stitched with a soft sole, their history trails back to the days of Native Americans’ foraging in the wilderness. Adorned with tassels, beads, and a gluttony of hand-drawn designs, moccasins are undisputed in the eccentric department. Finish off your casual outfit with a pair of retro sneakers to match your jeans and t-shirt. No fancy technology, just rubber soles, dyed canvas, and heart-warming nostalgia. 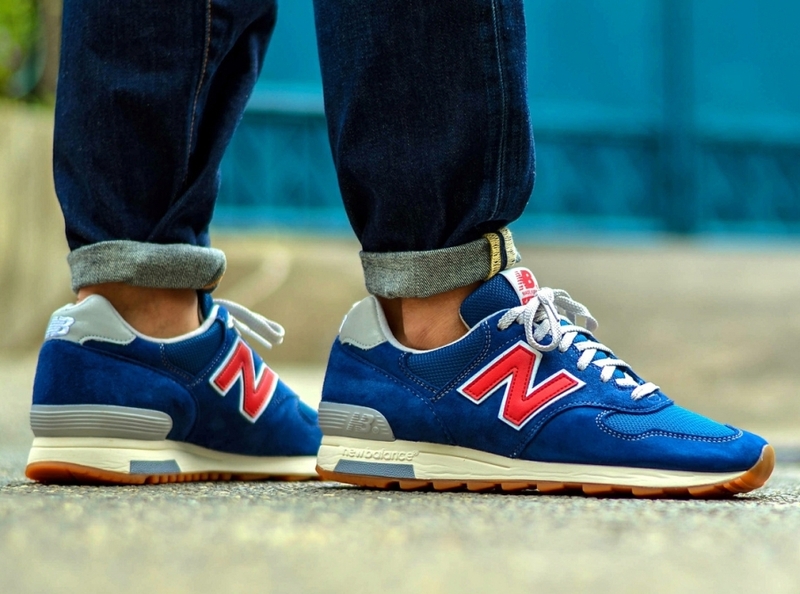 Modern day sneakers will never have the old-school cool that vintage runners like New Balance and Chuck Taylors bring to the table. The simpler the colours, the more timeless the look. Modern day sneakers with an emphasis on comfort, whether it’s foam or an air cushion to support the base of your feet and a soft, lightweight upper to wrap your foot. We take the comfort and versatility of the everyday running shoe for granted, while they continuously help us get through our days without reward. The mark of a true champion. If you want reliability, killer visuals, lightweight support, and cutting-edge footwear technology, you can never go wrong with a pair of runners. Trainers are, and will always be, the most comfortable selection to keep your feet on the ground. Not exclusive to winter, though they’re the only footwear suited for frigid weather. 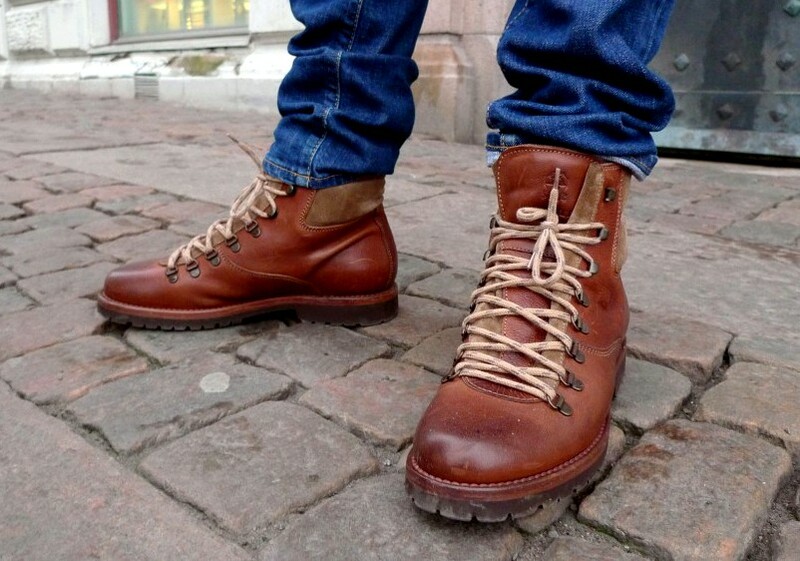 Most of the boots possess military and explorer origins due to their rugged build and multi-facet functionality. 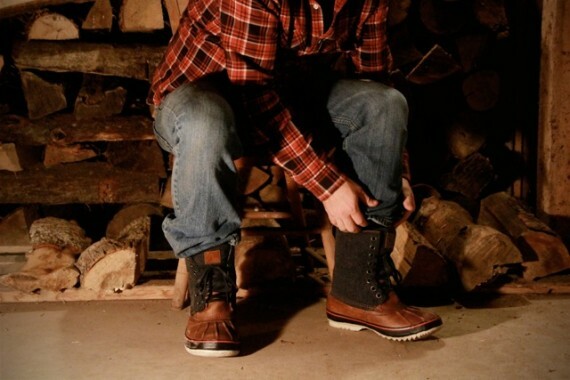 Vulcanized rubber lug soles will withstand the harshest elements and provide traction on most winter surfaces. 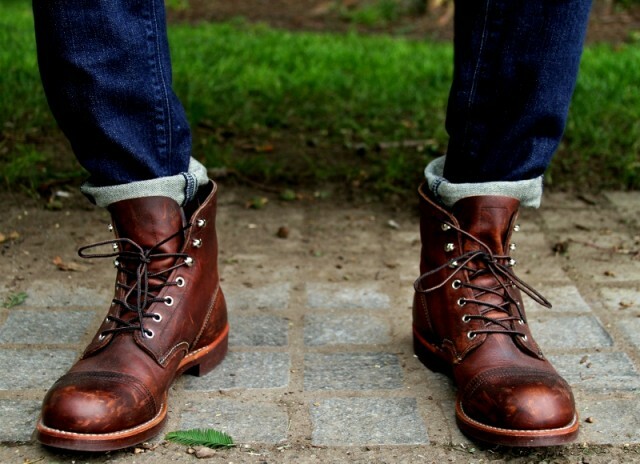 Leather Boots are the undisputed champion in style when it comes to winter footwear, but can still get down and dirty with the rest of ‘em. The durable, water-resistant leather forms a rugged exterior to trap in heat and keep out the wind. No, cowboy boots don’t count. Widely popularized by British rock stars, the fine leather finish makes it the sleekest selection out of winter boots and a must-have match with a trench coat. The sturdy build of the boot, from the metal lace eyelets to reinforced sole provide a rugged exterior and a perfect pairing with the shearling coat. The brogue detailing from Oxfords transfers over to winterwear and looks just as sharp. 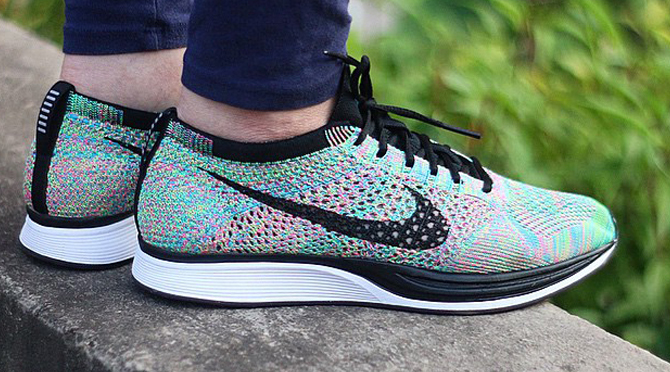 You’ll want a clean silhouette to pair with this one. Overcoat? Yes, please. For the true outdoorsman, one you can wear with your rolled up sleeves and get down n’ dirty. It’s Parka time. Man-made synthetic materials have a longer lifespan than natural leathers, thus can withstand the harshest elements with minimal maintenance. Waterproof and insulated nylon, coupled with leather for additional comfort, is the strongest weather barrier you can have in winter footwear. Most winter boots are either leather or hybrid (part leather and synthetic) as full synthetic winter boots are an absolute eyesore and aren’t necessary unless you live in year-round arctic climates. Sadly, there won’t be a North Pole Fashion Week 2015. 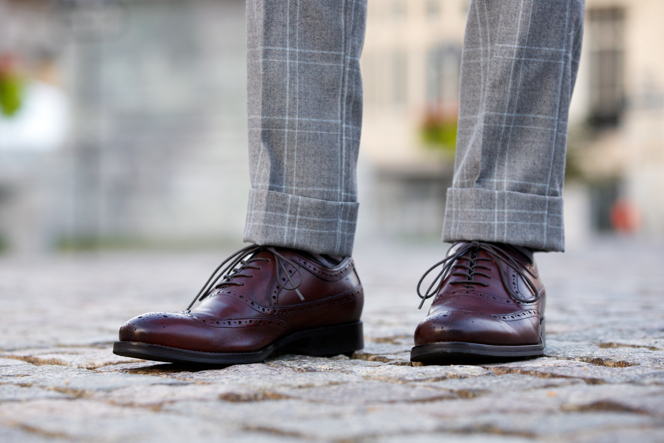 Whether you use them as your statement piece or as a comfortable method of transportation, shoes will always set the precedent as the most important attire you will wear. Shirts, suits, and other garments all have their day, but there’s something special about shoes that lights up your insides in a way no other article of clothing possesses. The saying “Be comfortable in your own shoes” can be translated literally as one’s ease while wearing their preferred footwear. It doesn’t matter what you wear as shoes, as long as they make you feel fantastic. I have seen people wear sandals during the winter and wool boots during the summer, throwing all footwear rules out the window. The most important thing is that every step you take should be with the utmost confidence. We just advise you on what looks best and what is best suited for certain situations. So whatever journeys life may take you, footwear will be the constant connection between you and the Earth. Make it special.